​For NFL fans in the UK the Washington Redskins were the first Super Bowl champions we witnessed crowned. For many, even fans of other teams, the Redskins will always have a special place in many UK NFL fans’ hearts. Ironically enough, when Channel 4 first started covering the NFL in the United Kingdom in November 1982, the Redskins were one of the few teams to show any interest in the broadcaster. Because of this, Channel 4 ran slightly more segments and one-one-one interviews with members of the Washington Redskins over those initial seasons. Joe Theismann (left) and John Riggins (right) were arguably the first "NFL heroes" in the UK! ​Joe Theismann was their leader and his partner in crime was the bruising running back, John Riggins, and each played a prime role in their team’s Super Bowl XVII victory over the Miami Dolphins back in January 1983. 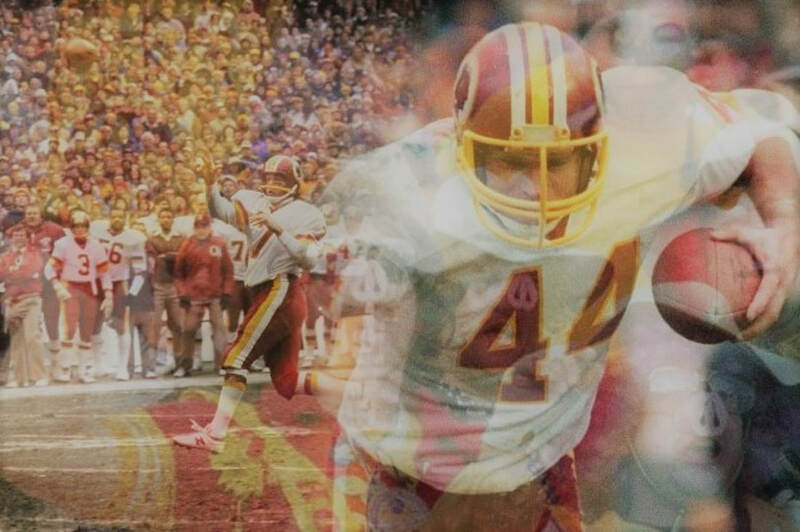 The video clip below is a news feature on Riggins' return to the Redskins after sitting out the 1980 campaign. The Redskins looked far from dominant in their nine regular season games of the strike shortened 1982 season – their MVP was kicker Mark Moseley who had kicked last second field goals in numerous games. It was during the strike though that the Washington Redskins were born into what they became, and when signal caller Joe Theismann truly stepped forward as their leader. When the strike was over, they were indeed ready to play, posting an 8-1 record in their nine games. Scrappy as their style was, they got the job done. 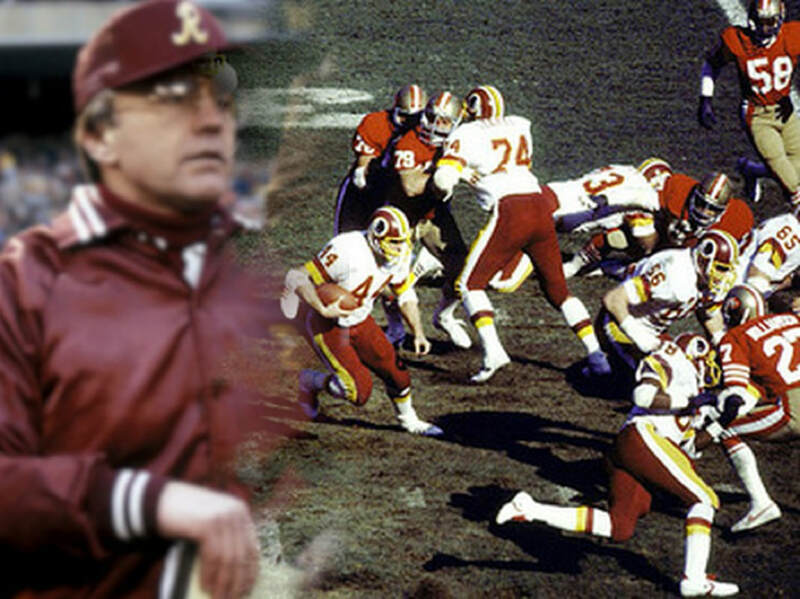 As the playoff tournament began they stepped up a gear – and the main reason was the play and head coach Joe Gibbs’ use of John Riggins. In the first round playoff Washington hosted the Detroit Lions. They were in control from the start with Theismann firing three touchdown passes while Riggins ran for 119 bruising yards in a 31-7 win. The following week in a 21-7 victory over the Minnesota Vikings Riggins racked up 185 yards as the Redskins bullied and battered their way to the conference final. This was the game where Riggins truly exploded and when he finally left the field, he removed his helmet and took a theatrical bow to each side of RFK Stadium. With the result in no doubt, the crowd chanted “We Want Dallas!” in unison over and over again. The NFC Championship did indeed feature their arch rival Dallas Cowboys, and the Redskins, like the frenzied crowd at RFK were ready for them. 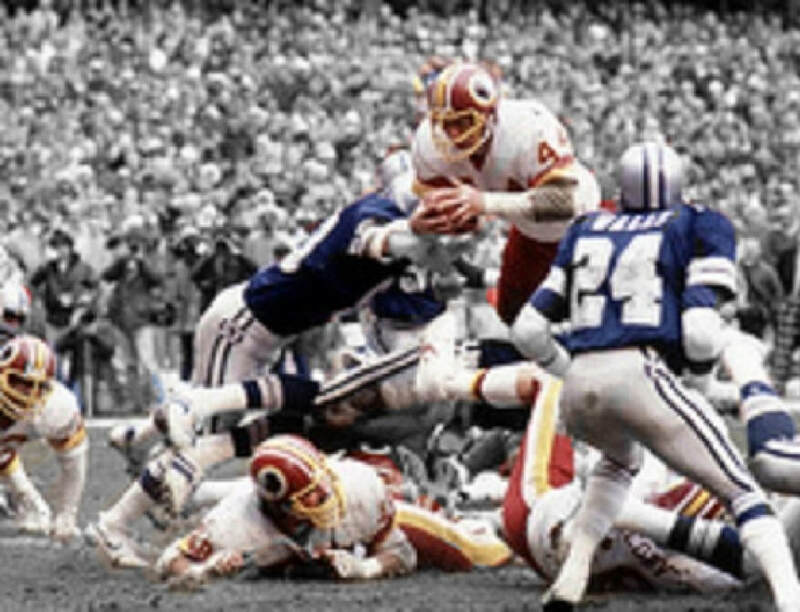 Washington were up 14-3 at the end of the first half, and had knocked out the Cowboys starting quarterback, Danny White following a huge hit by Dexter Manley. Although Dallas did manage to cut the lead to 21-17 in the third quarter, the Redskins’ defense sealed the win with a 10 yard interception return for a touchdown by defensive lineman Darryl Grant. It certainly would have been. Quarterback Joe Theismann had similar feelings but his were more a chance to make up for a mistake he felt he made over a decade earlier when he was originally drafted by the Miami Dolphins in 1971. Knowing he would be stuck behind Bob Griese in Miami, and the lure of a big contract in the Canadian Football League Theismann opted to sign with Toronto Argonauts. In the NFL Films series “America’s Game” years later he told how he regretted his decision the following year when Griese was hurt and replaced by Earl Morrell, who Don Shula had essentially signed due to Theismann not signing with Miami. Had Theismann signed with the Dolphins it would have been he who would have taken over under center of the unbeaten Miami Dolphins. The contest initially seemed to favour the Miami Dolphins, who looked looser and more on their game than Washington. Miami initially took the lead and no sooner had Washington finally leveled the score 10-10 late in the first half did Miami’s Fulton Walker return the following kick-off 98 yards for a Dolphins touchdown to go in at halftime with a more commanding than it sounded 17-10 advantage. However, the second half belonged to Washington and in particular John Riggins. The Bruising running back gained 166 yards on the ground off the back of 38 carries and was named othe contest's MVP. Forty-three of those yards came in one of the most memorable runs in Super Bowl history. ​The play was called 70 chip and it was designed to go left and pick up a yard or two – basically it was a short yardage play. 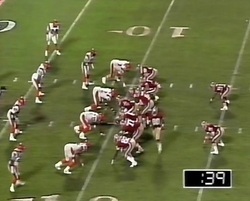 However, Miami safety Don McNeil slipped while following his man in motion, so as Riggins rumbled through the line off the back of solid blocking from The Hogs (the Redskins offensive line), McNeil was not there to meet him and barely got a hand on his jersey. Riggins stiff armed him off and rumbled all the way for the touchdown. The Redskins were ahead 20-17 and went on to hold off the stunned Miami Dolphins to claim a 27-17 victory. Joe Gibbs (left) turned around the Washington Redskins - and it started with a solid offensive line, The Hogs! 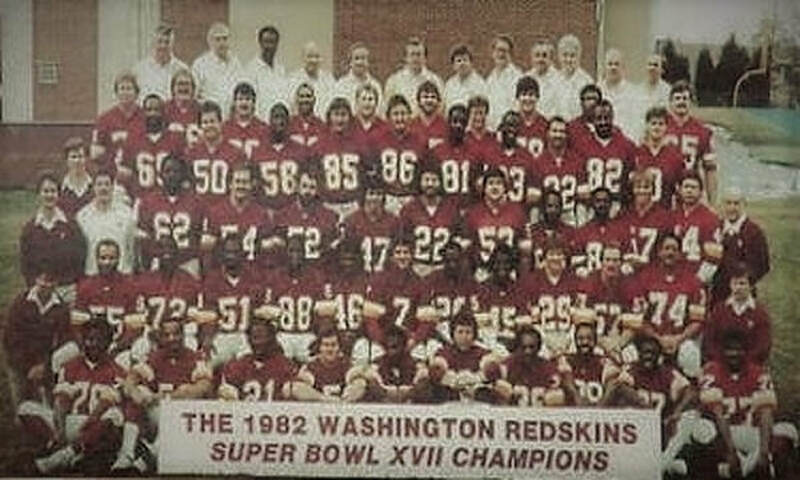 The following season in 1983 the Redskins were arguably one of the greatest to ever suit up. But one Sunday afternoon in January 1984, their legacy was tarnished forever. They are not remembered as one of the greatest teams to ever play, ultimately because they didn’t win consecutive Super Bowls, but it should be remembered the team they lost to the Los Angeles Raiders were no chumps! In 1983 the Washington Redskins notched up a then record 541 points, a record that stood until 1998 when the Minnesota Vikings topped the mark. They also had a points differential of +209 points, and went over the 30-point mark in eleven of their sixteen regular season contests. Not that their defense was letting the side down. 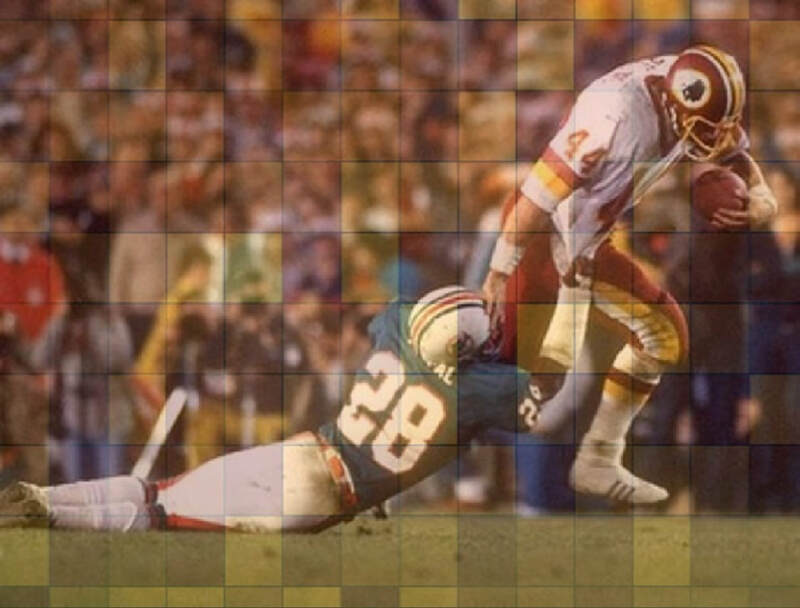 They had a +43 turnover margin themselves, and contained a ferocious pass rush led by Dexter Manley. Their regular season record was 14-2, with each loss coming by a single point, 31-30 to their rival Dallas Cowboys and 48-47 in a wild shoot-out with the Green Bay Packers – both games were Monday night games coincidentally or not. For the vast majority of the year though the Redskins looked unstoppable. Joe Gibbs was named coach of the year while Joe Theismann was the league MVP in multiple polls around the country as he threw for 3,714 yards and fired 29 touchdowns against only 11 interceptions with a 97.0 quarterback rating. Riggins incidentally set the season touchdown record when he notched up 24 touchdowns and added 1,347 yards on the ground to boot. He would also go on to add two more 100 yard games in the two 1983 playoff victories stretching his post-season record to six straight playoff games going over the century mark. Once in the playoffs the defending champions dismantled the Los Angeles Rams and their star rookie running back, Eric Dickerson, 51-7. A week later they welcomed the San Francisco 49ers to RFK Stadium to play for the right to go to Super Bowl XVIII. The 1983 NFC Championship game was a throwback game visually and as it played out. The RFK field was muddy, it was cold, and the RFK crowd was noisy. Washington steadily built up a 21-0 lead over the 49ers before San Francisco mounted an aggressive comeback, eventually tying the game late in the final period. Two questionable calls against the 49ers then arguably turned the game - a pass interference penalty against Eric Wright, and a holding penalty against Ronnie Lott. This led to Mark Mosley winning the contest with a 25-yard field goal with only forty seconds remaining. A final interception of 49ers' quarterback Joe Montana sealed the victory and the Redskins were heading to Tampa to defend their title in Super Bowl XVIII against the Los Angeles Raiders, a team they had beaten earlier in the season. 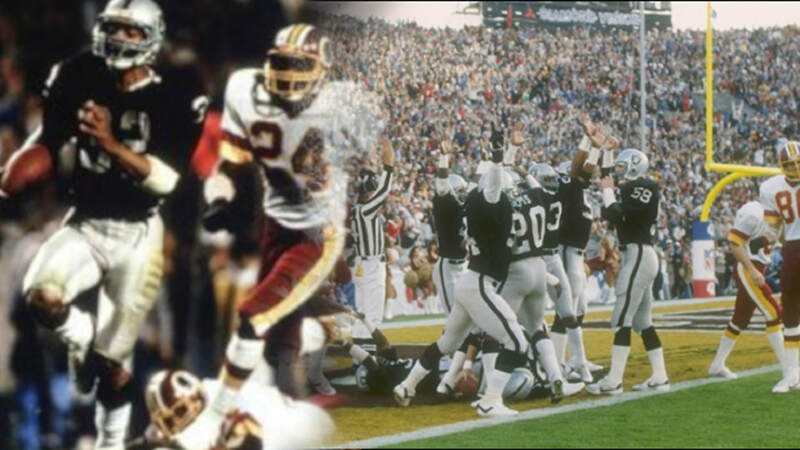 A blocked punt (right) resulted in the opening score of Super Bowl XVIII - the Raiders never looked back as Marcus Allen (left) rushed to an MVP award! The regular season game in the fifth week of the campaign is regarded by some to be the best regular season game ever played. In a hot and rocking RFK Stadium (literally – the stands at RFK shook) the Raiders led 35-20 late in the contest. Joe Theismann led Washington on a memorable fourth quarter comeback to eventually steal the win 37-35. For whatever reason though, the Redskins just did not get going this particular Super Sunday afternoon on January 22nd 1984. A blocked punt resulted in the first score of the game and a 7-0 lead for the Raiders. They extended the lead to 14-3 late in the first half, and then came the first of the big punches. The first play that took the Redskins from frustrated to dazed and wobbly. Backed up at their own 12-yard line following a Raiders’ punt, with only 12 seconds to play in the first half, Gibbs chose to call the same play that had sparked his team's come back of the Raiders back in week 5. A play called “Rocket Screen.” However the Raiders had done their film study, as soon as the ball left Theismann’s hand, intended for running back Joe Washington, Raiders’ linebacker Joe Squirek leapt in front of the pass for the interception, scoring a step or two later. Instead of simply running out the clock and going in at half-time eleven points adrift, the Redskins were now down 21-3. On the last play of the third quarter with the score now 28-9, just as Riggins had struck the knock-out blow for his team a year earlier, Marcus Allen did the same for the Raiders. Taking the hand-off from Jim Plunkett, Allen headed left before running into what appeared to be half of the Washington defense. He reversed his momentum, ran in a complete circle and back to his right before sprinting right through the line and down the field on his way to a 74-yard touchdown run. Allen would end the day with 191 rushing yards and, like Riggins the year before, was named the game’s MVP. The final score stood at 38-9, at that time the most lopsided score in Super Bowl history. In the space of sixty (game time) minutes the Washington Redskins had gone from the one of the best teams to ever grace the gridiron to heavy losers in the eighteenth Super Bowl. Looking back, this is very unfortunate, not only for the Redskins but for one Joe Theismann in particular. While both John Riggins and head coach Joe Gibbs wound up in the Hall Of Fame, the Redskins signal caller ended his career in a no-man’s land of sorts. Theismann is in a similar category to Jim McMahon one time head-butting quarterback of the Chicago Bears – maybe they don’t warrant entry into the Hall Of Fame, but they deserve a little more space than just a footnote in NFL history. As do the 1982 and 1983 Washington Redskins – maybe not technically a dynasty, but would you want your team to have to play them? Ultimately though, the Washington Redskins didn’t just lose the Super Bowl that afternoon against the Los Angeles Raiders. They arguably lost their rightful place in NFL history. ​In Kansas City Joe – Montana’s Quest For A Fifth Ring, And A Swansong Of Classic Quarterback Duels we take a look at the legendary quarterbacks two years in Kansas City, some of the classic games he had as a Chief, as well as the hit that sent him there in the first place.